Turkish President Recep Tayyip Erdogan addresses supporters at a rally in Istanbul, March 19, 2019 (AP photo by Emrah Gurel). 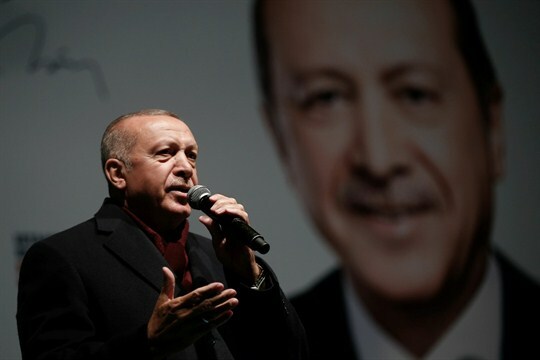 Turkish President Recep Tayyip Erdogan and his governing Justice and Development Party, or AKP, are engaged in a no-holds-barred campaign of threats and intimidation against opposition parties ahead of local elections planned for Sunday. Opinion polls have found AKP candidates trailing in key cities like Istanbul and Ankara amid an economic recession that has damaged Erdogan’s political brand. Fearing a resounding defeat at the polls that could undermine his presidency, Erdogan has even said he could intervene to change the results. In an interview with WPR, Sinan Ciddi, executive director of the Institute of Turkish Studies in Washington, explains what’s at stake for Erdogan.